To further enhance its service and support the end goal of eliminating unplanned downtime for Beckwood machine owners, Beckwood Press, St. Louis, MO, has introduced TechConnect—a remote connectivity system designed to offer complimentary offsite, factory-provided diagnostics and troubleshooting of its hydraulic presses and Triform hydroforming machines. Using TechConnect, Beckwood engineers can interact with presses in the field and perform remote troubleshooting, maintenance and other functions, and can remotely upload PLC and HMI program updates. TechConnect, integrated into the press control system and connected to the customer’s standard internet network, also expedites offsite operator training without the expense and time associated with onsite travel. If a machine stops operating at the ideal level, a Beckwood engineer can be notified and begin troubleshooting the issue within minutes. 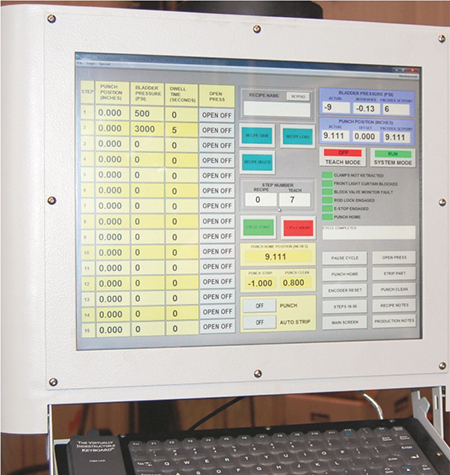 And, should a customer determine it needs to add a nonstandard button to the machine’s HMI, Beckwood engineers also can do this through TechConnect.